WASHINGTON (CNN) -- President Obama's accusations that Iran's nuclear program runs afoul of international agreements are "baseless," the Islamic republic's president told CNN's Larry King on Friday. 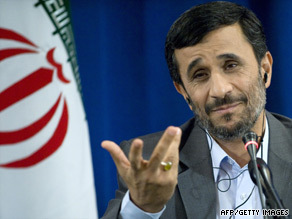 Iranian President Mahmoud Ahmadinejad says President Obama's accusations are "baseless." "We did not expect Mr. Obama within less than 48 hours, to basically violate the commitment that he spoke of at the United Nations," said President Mahmoud Ahmadinejad. Earlier Friday evening Obama said "Iran is on notice" regarding its nuclear efforts, and that the international community is united in its opposition to Tehran's nuclear program. Obama's comments came hours after Iran acknowledged the existence of a second uranium enrichment facility and ahead of next week's planned meeting between Iran and the five permanent United Nations Security Council members, plus Germany. The October 1 meeting will take place in Geneva, Switzerland. Obama said he would not speculate on any course of action absent a satisfactory response from Iran. "Even countries who a year ago or six months ago might have been reluctant to even discuss things like sanctions," are starting to become concerned, Obama said. Obama said his "preferred course of action is to resolve this in a diplomatic fashion. It's up to the Iranians to respond." Iran told the IAEA there is no nuclear material at the site, an agency spokesman said. Iranian President Mahmoud Ahmadinejad did not mention the Qom plant during his visit to New York this week for the U.N. General Assembly sessions. He reiterated earlier claims that Iran has fully cooperated with nuclear inspectors. He emphasized this again Friday afternoon at a news conference, where he said Iran complied with IAEA regulations requiring it be informed at least six months before an enrichment facility becomes operational. "We still have a year left before that six months kicks in," Ahmadinejad said. Iran's revelation of a new nuclear site could actually "strengthen their hand" as Tehran heads into next week's talks, according to Paul Ingram, an analyst who studies Iran and nuclear nonproliferation. "It will be seen as an indication that they are willing to play by the rules," said Ingram, the executive director of the British American Security Information Council in London, England. He said the timing of Iran's revelation, between the U.N. General Assembly sessions and the October 1 meeting, is deliberate on Iran's part. "This will make it more difficult to persuade them to abandon enrichment," Ingram said. Washington became aware of the covert facility near Qom several years ago, but a clearer picture about the facility emerged later, a U.S. counter-proliferation official said. The enrichment facility would probably not be operational for another year, the official said. The official said the newly unveiled facility "doesn't really change the baseline" conclusion of the 2007 National Intelligence Estimate, which concluded that Iran could manufacture a nuclear weapons between 2010 and 2015. The official added that there are suspicions about other possible hidden or undeclared nuclear-related facilities. CNN's Ed Henry, Dan Lothian, Pam Benson, Matthew Chance and Moni Basu contributed to this report.